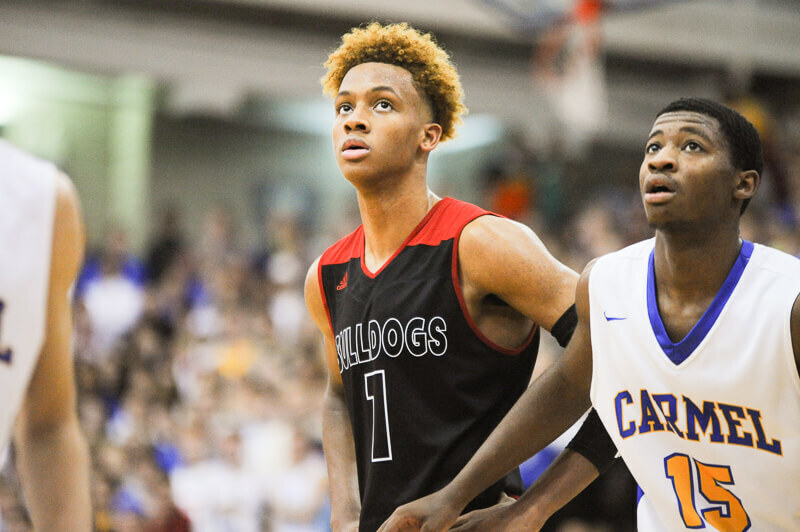 Indiana coach Archie Miller announced on Monday afternoon that the Hoosiers have signed five-star guard Romeo Langford to a National Letter of Intent and also will welcome St. Mary’s graduate Evan Fitzner to the roster for next season. BLOOMINGTON, INDIANA — Indiana University men’s basketball coach Archie Miller has announced that Indiana Mr. Basketball and McDonalds All-American Romeo Langford, a 6-6, 200 lb., guard from New Albany (Indiana) High School, has signed a national letter of intent to attend IU and play basketball for the Hoosiers and that Evan Fitzner, a 6-10, 230 lb. forward, who played his first four seasons at St. Mary’s (California), will join the Hoosiers as a graduate transfer and have one year of eligibility. The duo joins small forward Damezi Anderson (South Bend Riley/ranked 114th), power forward Jake Forrester (Harrisburg, Pa./Westtown School/ranked 128th), small forward Jerome Hunter (Pickerington, Ohio/North/ranked 49th) and guard Rob Phinisee (Lafayette/McCutcheon/ranked 100th) to form the seventh highest rated recruiting class in the country according to Rivals.com, which also rates as the best in the Big Ten. Langford, Anderson and Phinisee will play for the Indiana All-Stars against Kentucky later in June, giving the Hoosiers three future players in the event for the first time since 2012 and just the second time since 1989. • Will be the 27th former Indiana Mr. Basketball to play for the Hoosiers and 21st former McDonald’s All-American to suit up for the Hoosiers … also named the Gatorade Indiana Player of the Year, one of three finalists for its National Player of the Year and one of seven considered for the Morgan Wooten Award which is presented to a player who displays outstanding character, shows leadership and embodies the values of a student athlete … named a Naismith All-American twice and MaxPreps All-American as a senior… was selected as the National Player of the Year for the sophomore class in 2016 by MaxPreps. • Had 19 points in the McDonald’s All-Star Game and 14 points in the Jordan Brand Classic … also selected to play for Team USA in the Nike Hoop Summit but sat out due to injury… attended the USA Basketball Men’s Junior National Team minicamp in October 2017 … played on USA Basketball’s FIBA U19 World Cup Team in Egypt that earned a bronze medal. • Played four years at New Albany High School for Coach Jim Shannon and led the team to a 110-10 record, a 2016 Class 4A state championship, multiple sectional and regional championships and four Hoosier Hills Conference crowns … finished as the school’s all-time leading scorer and rebounder (907) … broke the school’s single-season scoring record with 923 points as a senior… he also scored a school-record 63 points in a game against Jennings County as a senior. • For his career, he averaged 28.0 points, 8.5 rebounds, 2.1 steals, 2.9 assists, 2.2 blocks, and shot 56.0% from the field, 36.0% from three-point range and 79.0% from the line …was the top vote getter for Indiana AP All-State honors three times and four-times on the All-Hoosier Hills All-Conference team. • Averaged 35.5 points and 8.9 boards as a senior, 28.7 points, 8.9 rebounds and 3.4 assists as a junior, 30.2 points and 9.0 rebounds as a sophomore and 17.1 points and 6.0 rebounds as a freshman. • Four-time New Albany News and Tribune Boys Basketball Player of the Year, three-time Louisville Courier-Journal Player of the Year and Male Athlete of the Year… a four-time member of the Indiana Basketball Coaches Association Supreme Top 15 squad. • Played AAU ball with Twenty Two Vision prior to his senior year … also played AAU ball for the Eric Gordon All-Stars. • He is the son of Tim and Sabrina Langford of New Albany and has two sisters, Tiffany and Tisha … born on October 25, 1999. • Langford will be the first player from New Albany High School to play for the Hoosiers since Paul Poff was with the program from 1953-55 … he played in 46 career games for Indiana averaging 2.5 points. • Fitzner is a native of San Diego, California and attended Francis Parker School where he graduated from in 2014 … was a redshirt at St. Mary’s in 2014-15 … is graduating with a degree in business administration. • Fitzner started 76 games for the Gaels over the last three years and averaged 6.4 points and 3.5 rebounds in 105 games … shot 41.4% from three-point range and made 126 of 304 attempts from long distance … also shot 78.1% from the free throw line. • Last year, he averaged 5.0 points and 2.8 rebounds and shot a career-high 48.2% from the field … had a season-high 20 points against Washington in the NIT … as a redshirt sophomore, he averaged 5.5 points and 3.2 rebounds and shot a career-best 42.9% from long range as he helped his team to a 29-5 record … as a redshirt freshman, he was named to the West Coast Conference All-Freshman Team when he averaged 8.7 points and 4.4 rebounds … had a career-high 21 point effort at Santa Clara and also scored 20 that season in a win over Gonzaga. • Played for Coach Jim Tomey at Francis Parker School and led his team to a 26-6 record and a Coastal League title as a senior … was a two-time All-League selection and was league MVP as a senior … squad also went to the San Diego CIF Division IV semifinals in 2013 …also played AAU Basketball for Double Pump Elite. • He is the son of Mark and Cheri Fitzner … Mark played basketball at Stanford and Cheri was an All-American volleyball player at the University of Hawaii… brother, Bryce, was the San Diego Prep Athlete of the Year as a football and volleyball player in 2012 and played football at Kansas State … born on January 1, 1996. Been waiting for Romeo to sign his LOI, so Archie can make comments and send strong message to future recruit such as TJD, KBJ and TW. Back on track! I think TJD and KBJ are both going to commit over the summer. Isn’t KBJ expected to sign with MSU? Oxygen please! This is too much in one article, and I’m about to faint. Lol. I keep saying this, but those who play together tend not to commit together. No? Don’t get me wrong I would love to get both of them. Yeah but his dad played for Schilling and I bet we’re working on him. Especially with the crap going on at MSU. Yeah I was hoping he would sign the LOI soon. the candy stripes and I will be happy. Guess I need to keep my BIG Network subscription. Going to be watching a lot of B-Ball next season. I don’t think he’s expected to sign with MSU. From everything he’s been saying about it being an honor for an Indiana player to have “Indiana” on his chest, and then Schilling’s relationship with his dad, I’d say IU is in great shape with him. Maybe the best of all our 2019 recruits. Only reason I have cable. Corey, that is a great point. Comcast dropping the Big Ten Network here in the Chicago area means millions of alumni having to pay a subscription. It hasn’t really been discussed on ITH but it will be a huge topic with alumni once it is dropped. That would be great!!! I also hope Oscar T. comes with them. Is there a date for Hoosier Hysteria yet? I thought they weren’t dropping it in any Big Ten markets. Maybe they’ve forgotten that NW is in the B1G. I was basing my comments on his comments after his visits where he said MSU is like a family and he could see himself playing there. I think 247 gives MSU a 75% probability but who knows. You are correct and I am wrong. The Chicago area will not lose the Big Ten Network. I didn’t know that before I posted. My bad and thanks for clarifying. I miss the “good old” days of Chuck Marlow and the intro of the cleaning lady singing the fight song! Three IUnfaithful have hung in there through some uos and downs in recent years. Looks like the right people are on the bus from a coaching and playing perspective and I couldn’t be more excited about it . With the existing roster getting better each year, the new studs coming in, and Archie’s system and style getting further engrained I couldn’t be more pumped!! Also available through Hulu Live. So you can buy a la carte B1G subscription to watch on YouTube TV or Hulu Live? …. or are those just other options where you still need to enter your cable providers information so you can watch them “on the go” while you are away from your house? We live in an area of southern Indiana where we can get neither cable nor satellite service. Went to Hulu for about $40 a month and get everything we want including Big Ten, INDYCAR, ESPN, etc., plus local channels and all the movies we could ever watch. You may want to check it out. I basically only watch TV for sports, and for me YouTube TV has been a great option. BTN included. Obviously might not be great for everyone, but still. BTN comes standard with the YouTube TV base package. I’ve tried all of the streaming services and YouTube TV has been the best, especially with the BTN. Cut the cord and buy a subscription to PSVue. No contracts, so you can cancel during the offseason. I have it so I can watch the Cubs and IU. $45 / month. Totally agree on this. I tried them all and YTTV has the best picture, streaming consistency, and package. This cycle of recruiting has been kind of interesting. We had a flurry of activity when DA, RP, JH, and Race Thompson signed and there was nothing for five or six month then we land RL. The interesting part, is we go right back into another signing period so it seems like we gotten a full year of stellar recruiting by Archie and team. So Indiana Recruiting news has been out in front for a good period of time. I think his heart may be in Indiana, but his b-ball talents are leaning MSU. I remember him being mentioned in April 2017, something about him being excited that Archie was hired at IU. And now Archie has had a lot of time to go after him. Honestly, I’ll be surprised if he doesn’t choose IU. And that’s without considering the dumpster fire that MSU is right now. That was the biggest thing I noticed. Sling and Direct TV Now were both laggy and constantly buffered. YouTube TV was flawless. Good to see the LOIs in. Romeo’s impact is obvious, but I really think Fitzner is going to add much needed spacing, outside shooting, and rebounding to next year’s team. I’m guessing I’m guessing we end up with a 4 man class for 2019 with Morgan, Fitzner, Romeo, and a yet to be identified player leaving after this coming year. If I had to take a guess on who ends up a Hoosier I would probably lean TJD, Wat, a non-Indiana PG, and a non-Indiana SG. Great job Coach Archie!! IU now has the players. You and your staff will coach them up. This will be a great season. Make the Final Four! you have tried all the PAID streaming services.